Well, it didn’t deliver as many laughs as I expected (What? Tut away) but beneath it’s surface is something much more and better than I could have expected. An easygoing, lighthearted comedy drama with some actual acting from leading man Vince Vaughan, which we all knew he could do but had just forgotten. Vaughan plays David, an incompetent meat truck delivery driver who finds out he’s fathered 533 children (what?! That’s right) through anonymous donations to a fertility clinic 20 years ago. Now he must decide whether or not to come forward when 142 of them file a lawsuit to reveal his identity . . . and you thought you had a bad day. It all starts off very slow and by the book, setting the usual slacker spiel with David trying to set up a weed farm in his apartment, clocking up massive debts, as well as forgetting and messing up deliveries. His partner Emma, played straight faced by Coby Smulders (yes, she does. What? Don’t judge) announces she is pregnant and does not want him to be a part of the child’s life. Smulders (of How I Met Your Mother fame) is wasted (not literally drunk) in this movie, playing such a minor passive supporting role. Anyone could have played her. A highly unfunny set up and surprisingly serious, which was contrary to the impression I got from the trailers. However, it soon picks up once Damian Young’s (Who? Bill from Californication! Still who? Never mind. Watch Californication) Attorney Williams drops the bombshell. A ridiculous but intriguing premise. It turns out this is a remake of a French comedy, Starbuck. Unfortunately, I haven’t seen it but I am very tempted to see it to make comparisons. A funny, if drawn out, overreaction from Vaughan (No Soy David!) soon leads to him doing some reconnaissance on the 142 children, keeping his anonymity in check, leading to a good movie. As soon as David seeks advice from his useless lawyer friend Brett (played by the brilliant Chris Pratt), the jokes come in thick and fast, especially when Brett introduces the joys of parenting with his monstrous children. Vaughan and Pratt work well off each other and makes up for a stuttering start and once the kids come into it, there comes genuine humour and good drama. 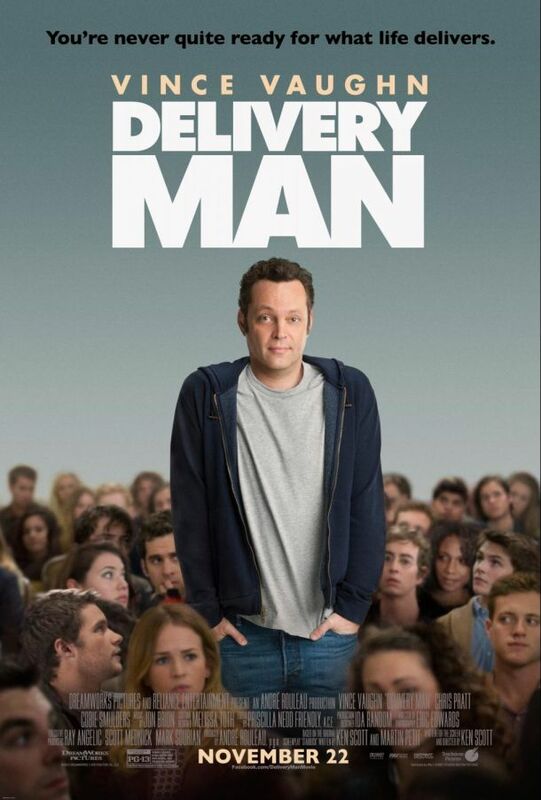 Considering this is a Hollywood remake, Delivery Man wasn’t afraid to branch out, providing a variety of different outcomes and, more specifically, children that David has procreated and the situations in which David attempts to be their “guardian angel”. Some situations are funny, Vaughan relentlessly attempting to get his lifeguard son to save him and one of his daughters parading herself in skimpy clothes for blokes to ogle (yeah, it’s a word. I’m bringing it back). Other scenarios were surprising, one (without spoiling) was done very well. The supporting cast were actually quite good including such talented up and comers as Josh Raynor (who will soon feature in the new Transformers movie) and Britt Robertson (she’s been around, you could say and not in that way, well who knows. Anyway, you may know her from The Secret Circle and Under the Dome). Once we get introduced to David’s family, at first irritating, you soon warm to them as home truths are shared, providing some engrossing scenes. I don’t know where the critics have got the notion that Vince Vaughan has lost it and should give up. I actually enjoyed The Internship, it may be have been OTT and ridiculously corny but it was funny. The most important factor in a comedy. Well you would have thought so. Vaughan brings a vulnerability and sincerity to David’s character. He didn’t really scream and pull stupid faces through this and he actually acted and acted well. Apart from a slow start, the film was quite enjoyable. The only other hindrance was the introduction of Viggo (Adam Chanler-Barat), one of David’s sons. At first, funny as he battles to find anything in common. It soon goes on for too long and just gets a little weird. Apart from that . . .
At times, endearing and engaging, it can also be incredibly corny and a little predictable but overall, the film delivers a pizza that has a really overdone cheese topping but get underneath it and it’s better than you think and quite enjoyable.